Fryston coach Danny Bolton: " 'Myton are a very well drilled side." Picture: Matthew Merrick. Fryston Warriors will aim to reach the BARLA National Cup final at Blackpool when they host Hull side Myton Warriors in the semi-finals on Saturday (2pm). 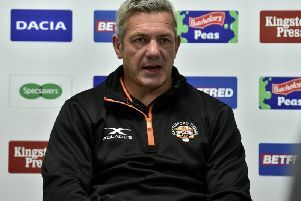 Fryston have already won the Yorkshire Cup, Pennine League Premier Division title and Castleford and Featherstone ARL David Poulter Open Cup this season. They also take on Sharlston Rovers in the Pennine League’s President’s Cup final at Batley on next Monday (3pm). Myton won 20-16 at National Conference League Division One Milford Marlins last Saturday. The defeat cost Milford top spot in the table. The game was watched by Fryston head coach Danny Bolton who said: “Myton are a very well drilled side who like to play fast rugby and don’t seem to panic too much under pressure so I’m expecting a tough game for our squad. Saturday’s game will be Fryston’s first fixture since April 6. The break has given players time to shake off little niggles and knocks and Bolton will be able to select from a full-strength squad. Club secretary Malcolm Agar is expecting a big crowd at Fryston Welfare on Saturday.